It seems there are still many people that are unsure whether to mine BTC or not, and, at this point in time, I see it still in many forums. So, at the current bitcoin value (3 567 USD) is it worth it to mine? Very straight and short answer - NO. Here is why. If you are new to mining BTC then you probably have to buy an ASIC system. So let us say you are willing to start slow so you go ahead and buy an S9j. The S9j will cost you $392 USD plus shipping. 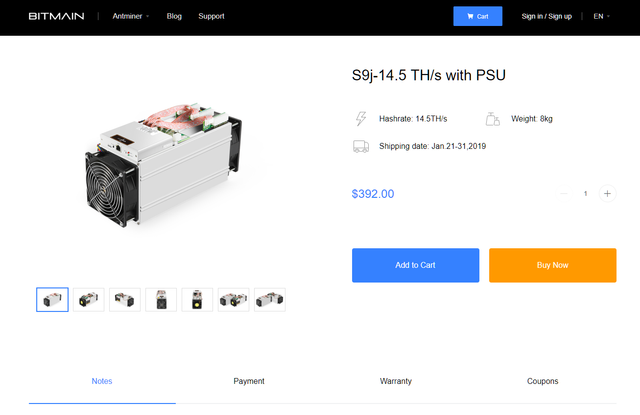 - Info @ https://shop.bitmain.com/product/detail?pid=00020181224111801579RRBMk56O064D - and will be able to mine at 14.5 Th/s, consuming 1350Watts (that's 1.350 KW/h). Now, let us assume your electrical costs are not high and sit at 0.055 USD per KW/h, and you are using a pool that only charges 1% commission (most charge more). You would be getting a profit of 148.44USD a year. Wow! That is good right? Wait, don't be so excited yet. You still need to pay for your initial investment of 392USD plus shipping of the ASIC system. Lets not even consider that you would have to pay import taxes and that the shipping is only 25 USD. A total initial investment of 417USD, with 148.44USD of profit a year, which means you will need nearly 3 years to recover that initial investment. In addition, you will have a fixed yearly electricity cost of 650.43 USD, which will total 1 951.29USD for that whole period. Meanwhile, at the current difficulty level, this Asic will only be able to mine 0.22 BTC a year. From this amount, you will have to deduct electricity costs. The 148.44USD at the end of the year would be equivalent to 0.0416148 BTC (if BTC value remains similar). The whole 3 years you will have acquired a total of 0.1249BTC. That's nearly the exact amount you can buy of BTC at this moment (at the current value of 3 567USD) with the capital needed to buy an Asic S9j plus shipment. Other important things to consider, your ASIC only has 180 days warranty, and may not last the whole 3 years. You may need to replace some parts, which means additional costs and periods of no mining activity. On the other hand, some may say that BTC value may increase, yes, that is true, but when that happens, the higher the BTC value, the more incentive to mine, therefore the difficulty will increase, which means your S9j will not be able to provide you with the 0.22 BTC a year like now at the current difficulty levels. If you want to consider the capital needed for the initial investment (like this example) of one S9j (417USD) plus the electricity costs for three years, at 0.055usd per KW/h (1951.29USD), that totals 2 368.29 USD. 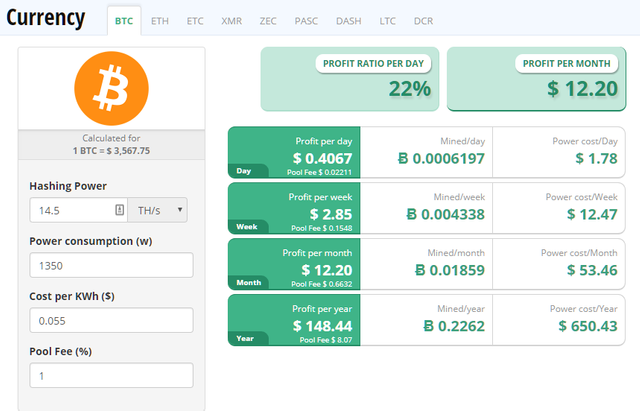 With this money, you can buy right now, 0.663944 BTC and own it hassle free being way more than you would ever have in your wallet at the end of three years as shown, should you wish to mine at this point. So, if you buy now and the value of BTC goes to the moon, your total benefit is instant and available, if you were mining, your BTC wallet savings increments would be less and less every month until your miner stops working. This is just an example, but it is valid if you wanted to buy more than one miner. And bear in mind, that 0,055USD per KW/h is a very low electricity cost (in my country with tax sits at a whopping 0,2230USD per KW/h). In case BTC value goes to 20K again or more, then you can sell a tiny fraction of your BTC, invest in an ASIC system and mine then. But for now, at this current value - between 3 and 4.5k USD, you better off just straight buying the coin, or any other relevant coin for that matter. Well, that is it dear steemians, hope I was able to make my point clear on the subject and that it helped you clear any doubts if you were undecided about it.